As the US health care system continues to court big data, clinicians are gaining comprehensive access to their patients’ electronic medical records. Attracted by the same goal, individuals have similarly begun to demand better personal technology targeted at health. Deryk Van Brunt, an Associate Clinical Professor at the School and the President of Healthy Communities Institute, however, believes that these data types and collection methods may overlook another set of factors that neither clinicians nor individuals have control over—the social and environmental determinants of health. In a recent article, Van Brunt vocalized support for Community Health Records, a new direction for health data which would address precisely those factors. To better understand how Community Health Records might achieve what personal health records and electronic medical records cannot, we asked Professor Van Brunt about his vision on achieving population health. 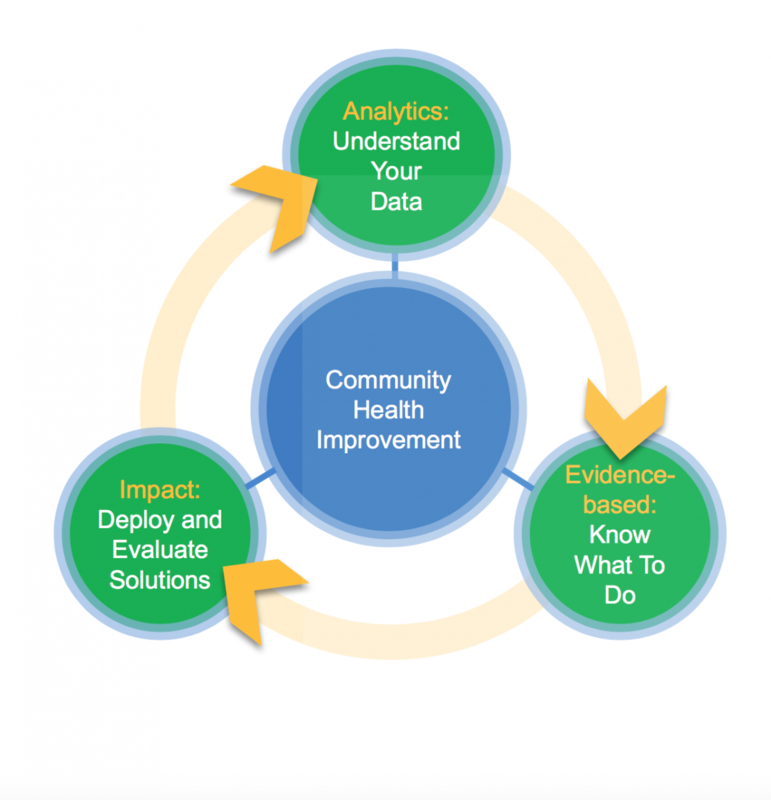 Q: What are community health records, and how do they improve health at a population level? If you look at determinants of health—that is, the factors that across a population lead to some people being healthier than others—you find that a large impact on health of a population-wide happens from decisions made at a community level. According to the most recent Centers for Disease Control and Prevention (CDC) findings, somewhere between half and two-thirds of the determinants of health have to do with a combination of people’s lifestyle and the physical and social environment in which they live. These factors, of course, influence each other. This means that factors such as income, education, physical activity levels, housing, and eating habits collectively affect a person’s health more than access to, and quality of, health care services. If we want to improve the health of the nation, it’s not a “nice to have,” to figure out how to improve people’s lifestyle and the social and physical environment in which people live; it’s a “must have,” to be successful in population health. It’s a big piece of the pie. Q: What do you mean by Population Health? Right now in the US, health and health care is moving from an old, fee-for-service system to value-based care. What that means is, organizations are beginning to take on risk for the overall utilization of health and healthcare services for people that they didn’t before. In the old model, you’d go to a hospital or clinic with a problem, the healthcare team saw you, responded, and they were paid. And if you came back two weeks later, they got paid again. We’re moving to a system where things like prevention, and better management of chronic conditions actually do two things: One is to improve healthcare delivery quality metrics, which typically leads to better health outcomes. That’s the main goal. But secondly, you can reduce, or at least hold, costs. That’s the macro shift that we’re in. But while most people in healthcare delivery are focused on these important activities, there are other aspects of population health – and one big one is community health. It will be from improving decision making at the levels of healthcare delivery, personal choices, and community choices, that we can make significant impact on improving population health. Q: How is the data that we currently collect causing this shift? What are their limitations? The first type of data we currently collect is an Electronic Medical Record (EMR), collected by clinical care teams. That’s the doctor, nurses, case managers, and all of those folks. They need information about the patients that they’re seeing. The EMR is a baseline set of information, and you perform interventions, and you track change over time. That’s the fundamental system that we spend most of our time on today. A second area is individual data, used by consumers to help improve the decisions they make about their lives. Just like electronic medical records, there will be a baseline set of information that an individual will have about themselves (or a family member or close friend). It will be the result of all those mobile and wearable devices you plug into, like your Fitbit. it will be the pieces of your electronic medical records that you’re interested in, it will be the photo that you took of your food that did an automatic calorie calculation. It’s going to be your baseline, with algorithms and programs that run on that material so you can track your own outcomes. Do you feel better or not? Are you happy or not? Can you run or not? That’s the second universe around what we’re going to need to do to achieve population health. We need to help individuals to make healthy decisions about their behaviors and beliefs. The third group, which is just as important, we’ll loosely call “the stakeholders in the community.” We define "community” as anything from a small group of houseboats somewhere to the more traditional city, county, region, and state. Stakeholders are the people who do things for the community. They're the ones who allocate resources, they create policies, they do things that individuals can’t manage for themselves, like air quality and water quality. Today, this is a sort of a gmish of various players doing various things, covering politics, philanthropic activities, public health. What’s missing for this third group is there’s no record. They don’t have the baseline that the doctors have to manage clinical care. They don’t have the baseline that individuals have, and will have, to manage their care. What I and my team are trying to do is to help stakeholders who greatly influence the management of the commons, become more data driven and evidence-based. So, if you’re going to be data driven and evidence-based, you need a baseline set of information. And then you implement programs and policies, and you see what’s effective. If you don’t have a baseline set of data within a community or between communities, then you can’t systematically understand what the effects of the interventions are. Q: What do you think is the most valuable thing we can from a systemization of data on the community level? The physical and social determinants of health in different geographic areas are quite different. It’s not like it’s all the same and we know what to do. It’s all quite different, and we don’t always know what to do. We’re going to collect this data, whether it’s through public health reporting, telephone interviews, whether it’s reporting data out of hospitals, whatever it is, and we will be able to look at insights which tell us that precisely how different communities have different issues. For instance, here in Marin County where I live, there are extremely high drinking rates. That’s not common all around the state. Community Health Records give insight about the variation of these important factors on health, and with those insights, we can pinpoint where we need to make improvements to our programs and our policies. It’s like giving a surgeon a sharper scalpel. You don’t need to “bludgeon” the San Francisco Bay Area with a certain plan around transportation if your principle problem is say, you have a group of low-income people with rates of premature babies in a zip code in Oakland that need straightforward access to prenatal care services. Q: How do you see community health records changing our physical and social environments? Imagine we have community health records for all communities around the country, and we have insights about those that are doing well, or not doing well, see the changes over time, correlate that with programs and policies that have gone into place. Imagine the wealth of data that will turn into information and wisdom about what works. If we have a consistent baseline set of data from which we can evaluate the impact of various programs and policies, we can begin to really understand what works. Once you have confidence in what works, you can begin to make serious positive changes. But we need to demystify, to reduce the risk, to know that if we raise hundreds of millions of dollars in a social bond, that we’re going to get the results we want. Making it evidence-based gives us the confidence to create serious positive change. This isn’t just a health issue – this can lead to a new level of political and social science. This isn’t just a health issue—this can lead to a new level of political and social science.